Hello and welcome back! It’s time for the first One Stamp At a Time Blog Hop of 2018. Our theme is Sale-a-Brate the Occasion, and we’re featuring projects and products from the new Stampin’ Up! 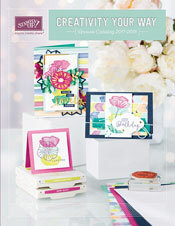 Occasions and Sale-a-bration catalogs. For my card set today, I used the Fruit Basket Photopolymer Bundle. I love the cute little fruit stamps with matching punches. Hello and welcome back! It's time for this month's One Stamp at a Time Blog Hop! The theme this month is Winter Holidays. I cheated a little bit this month, and am sharing one Christmas card and one Thanksgiving card. Hello and welcome back! It's time for this month's One Stamp At a Time Blog Hop. This month our theme is Fall and Halloween projects. I decided to use the super cute Creep It Real Stamp Set one more time! I made some Halloween treats as well as a card. Hello and welcome back! It's time for this month's One Stamp At a Time Blog Hop, and our theme this month is Throwback Thursday! Our assignment was to take a past project, and rework it with current stamps and products. I decided to rework a card set that I shared in this post. Only, this time I'm using the Painted Harvest stamp set. I can't seem to get enough of these sunflowers lately! Hello and welcome back! It's time for this month's One Stamp At A Time Blog Hop. This month's theme is birthday bash. Everyone can use more cards and other items to help celebrate birthdays, right? I decided to ink up a set that I've had sitting around for a while called Sweet Cupcake. I picked a sweet spring color combination, and made a card and small gift box.